Tools are only special if they are rare or too expensive for the competition. Like a Rolls Royce car or He-man’s sword. Unfortunately, this is mostly not true for those shooting corporate videos, documentaries and other Internet videos. Anybody can buy a cheap camera (and a good one!) and one great lens. You don’t need a lot of talent or knowledge to open up the aperture and get shallow depth of field. It’s not so special when everyone can do it! Good lighting, though, is hard to achieve. Lighting is one of the last few skills you can learn that will set you apart. It will help you deliver consistent and professional results quickly. That’s the key to thriving in this business. Nobody will give you beautiful models and great locations when you start out. That’s why you won’t get the same results as the countless lighting tutorials online. Good models in good locations will look good regardless of the lighting. But most of your clients and interview subjects (interviewees) are just average individuals. Chances are they won’t have much of a personality on camera, too. Some of them will be happy to appear presentable, wear make-up and so on, but most of them won’t. They’re not professional artists. And even if they feel they look great in real life, chances are they won’t have a clue how they’ll look on camera. Audio – Noise pollution and reverberation can ruin audio, and your reputation. Human beings have a lot of tolerance for poor images, but very little for poor audio. Natural lighting – Windows or lighting fixtures in the wrong places just make people look bad on camera. Space – There might not be enough space for you to place a camera or lighting equipment. Or, your best angle might be in the middle of a corridor everyone needs to access all the time. Matching – Even if one interview has a great location, the others might not. And interviews are meant to be cut together. The budgets that we work under for these projects make it difficult to raise production values with great locations. Sometimes you’ll get clients with cool offices, most times it’ll look like everyone else’s, or worse. The mistake, is to expect it. What are you going to do when you don’t have great locations? Or think about this – your competition has access to the same locations. How’s that going to help your pitch? Most clients don’t pay much, and they won’t mind if your idea of quality video isn’t that good. But that’s a slippery slope. Below average video production is easy to achieve. Any major city will potentially have thousands of freelancers and production companies eyeing the same projects. When all you can deliver is average or below average video, and everyone can match that – your client looks for the lowest bidder. Ask yourself: If you see the same product in 10 different stores, would you pick the cheapest? I would, because it’s cheap, and everybody has it all the time. The key to landing high-end projects is to deliver value that others cannot match. Watch high-end commercials or movies. All said and done, the teams that execute those videos are at the top of their game. They get access to the best equipment, studios, lights, actors, models and locations. You might wonder why they don’t call you instead. Ask yourself: Would you call a plumber (no offense to plumbers) who specializes in low cost housing to work on your expensive mansion? That’s exactly how the high-end video business works. If you want to land high-end corporate videos or documentaries, you’d better have something your competition doesn’t. That rules out any gear or locations you don’t own. Most corporates can’t tell the difference between a Red Epic and a red toothpick. If you have connections today, somebody else can make them tomorrow. After all, your clients aren’t your best friends. They’ll change their video production crew as quickly as they’ll change office chairs if that will get them more profits. People retire or change jobs. Or they have just been handed a budget cut. Exceptions exist, but they are exceptions. They might make an exception for you today, but they could just as easily take exception tomorrow. Don’t think so? Won’t you do the same? Won’t you change cameras or your assistant if they don’t perform well enough? Aren’t you always looking for the best deal? What if you aren’t the best deal today? What if you have great connections, but your way of doing things is so last decade? You do want to keep your advantage, don’t you? The easiest way to keep customers is to remind them of your value – by demonstrating it continually. So how can I stand apart? It doesn’t mean you have to win awards or anything. It doesn’t mean you have to sell large oil paintings for millions of dollars either. All it means is you have to be different. And you are different, by birth. Your life is different, your experiences are different, and the people you know are different. What you think is different, and how you feel is different. Use your differences to your advantage. In the world of video production, the single-most powerful skill you can have to stand apart and be different is lighting. Lighting is unique. It’s almost impossible to copy, it’s like a fingerprint. At the very least you should attempt to get better at lighting, and the better clients will start noticing. Otherwise they’ll just look at your price tag. How do I learn lighting? By learning from somebody who will save you time and money wasted on trial and error. I learned the first way. And it took me years just to understand and grasp basic concepts. Then it took a few more years to actually use it, make mistakes, learn from some of my mistakes – and not learn from others. Learning this way helped my ego, but nothing else. But I have an excuse, I didn’t have the resources (especially the Internet) when I was young. I didn’t have any contacts either. Don’t bother answering that. By the time you do, somebody else is already pitching for the projects you want. Time is the only thing you can’t buy, no matter how much money you have. So if you want to save time and learn lighting now, then I’ve got a course for you. After months of preparation, I’ve put together an online guide comprising of more than 15 lessons with 5+ hours of video. 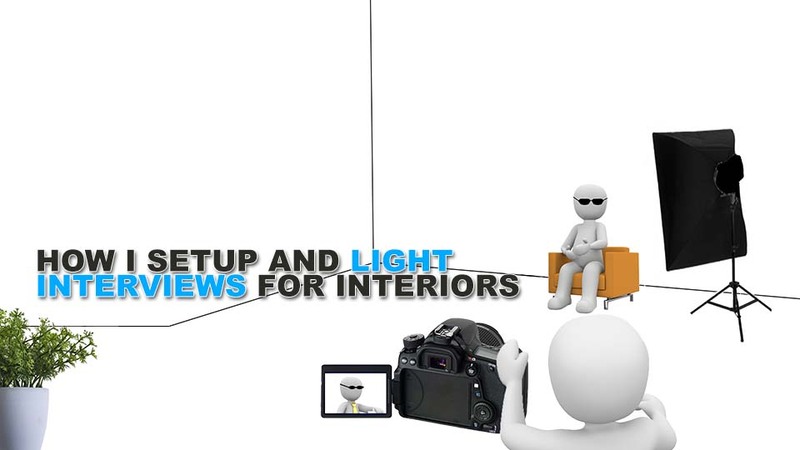 It will take you step by step through lighting for interviews in interior locations. With cheap and DIY lights. The guide will teach you everything you need to get started – including how to put together a cheap lighting kit and use it professionally. How is this guide any different from the hundreds of Youtube videos online? The videos online don’t show you what it’s really like to light something. They show you the lights, the positions, and the final result. But what if X changed, or Y changed? That’s what you’re up against. The Interview Lighting Guide shows you how to really light. I’m not interested in showing you some looks or tricks, but in teaching the real thing. If you can learn to light with cheap and DIY lights, you can light with anything. Believe it or not, that’s a skill many cinematographers don’t have. What if I buy and decide it’s not for me? You have 24 hours to change your mind. If you tell me the guide isn’t for you, within 24 hours, I’ll give you your money back. No questions asked. What if people copy my lighting? How’s that so? I’ll try to explain, though to really know you have to start lighting yourself. Most aspiring cinematographers have been led to believe they have to buy a “newer light” or “better lens” or whatever. The constant stream of marketing from companies hides the one fact that’s truly important. Painting is a good analogy. You can buy the most expensive brush and paints, the rarest canvas and the most beautiful studio with north light to kill for, and still produce crap. What makes a painting is not the tools, but the painter. A guitar in the hands of a monkey is going to sound like a monkey, not a guitar. What are you going to do with those lights? Are there any settings you can switch on and produce work similar to Roger Deakins’? The great cinematographers use the same lights everyone else does, but what separates them is their vision. Cinematographers are painters of light. If you don’t see it that way, you’re not really seeing. The good news is: Decent lighting isn’t as hard as playing a piano. It does take time to learn, but it is a skill that can be learned. Like learning to ride a bike. You don’t need a professional bike to learn how to ride well, or to have fun. When you start to have fun, you will learn automatically. When you just try to ape the setups light manufacturers and their stooges designed to sell their lights (while hiding its flaws), you won’t get the same results. That’s your first big clue. When most people realize this, they get demotivated and just give up. It’s because in all that noise in the airwaves nobody’s telling them it’s they who matter. You know I love teaching and helping filmmakers (hundreds of thousands of them) from around the world. It’s awesome to have had thousands of emails from them appreciating how I’ve helped. It’s your support that keeps me going. So by this point I have earned the right to confidently tell you there’s a solution. It doesn’t matter where you start. It doesn’t matter what you own. If you have something that can produce light, I will show you how to light interviews with it. If you can light a human face, you can light anything. You’ll learn how to light one face well, that’s what – in any interior situation. 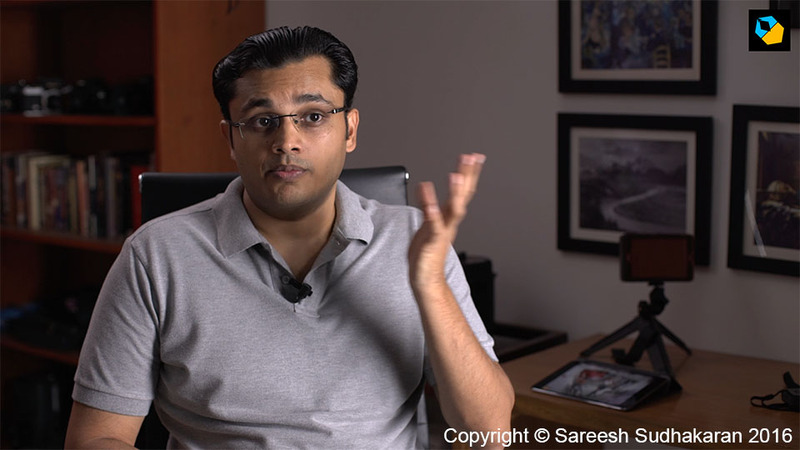 I’ll show you cheap and DIY tungsten halogen, fluorescent and LED setups, and how to build a simple and low budget lighting kit for professional interview lighting for interiors – even against bright windows! The videos have been designed for you to see me in the flesh (making mistakes too!) and follow my steps. By going through the guide at your own speed, one lesson at a time (you’ll have access to everything right from the word go), I am positive your work will reach another level. It will save you tons of testing and ‘stumbling around’ time. There’s free feedback for any work you want to show me, and free email support so you can ask me anything. How I made my latest commercial – for this very guide. You’ll see it in the link below. I can’t think of a single course that goes into this much detail for just lighting faces for interior locations. Get the Interview Lighting Guide for Interiors.